Powers Can cause harm to angels. These Enochian-etched brass knuckles were created by the British Men of Letters and allow for a human to cause damage to angels and possibly demons. When Ms. Watt confronts Dean and Castiel, she is wearing brass knuckles with Enochian spellwork etched into them. With Metatron's spell still in effect, Castiel's weakened state makes him all the more vulnerable, allowing Ms. Watt to make short work of Cas and Dean. After capturing Dean Winchester, Lady Bevell dons her own pair of Enochian brass knuckles and begins to beat Dean with them. As Sam, Dean, and Mary prepare to take the fight to Ramiel, Dean puts on the brass knuckles, but he is unable to lay any effective blows on Ramiel with them. 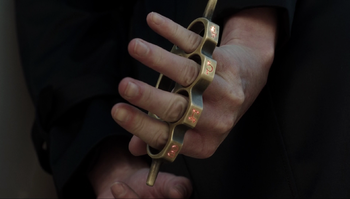 During Mary and Ketch's fight at the British Men of Letters Mobile Command, Mary pulls out a pair of the Enochian brass knuckles, prompting Ketch to laugh, telling her they only work on angels. Mary proceeds to kick him in the crotch and say that brass knuckles are still brass knuckles before clocking him in the jaw. While facing down Lucifer, Mary begins beating him back into the Apocalypse World with a pair of Enochian brass knuckles on each hand. Her final blow sends him reeling back into the portal, dragging her along with him. Mary is still wearing the brass knuckles as she attempts flee Lucifer in Apocalypse World. This page was last edited on 13 October 2017, at 08:23.